Today, language teacher Kieran Donaghy introduces us to a term we haven’t yet used here at Daily Edventures: Cineliteracy. Donaghy is a passionate proponent for the use of film to teach 21st century skills, and he’s happy to share everything he knows on the subject through his Film English website and Facebook page. Reflecting on his work, Donaghy told us, “I’d also like to think I have been successful in promoting critical thinking in the language classroom, and in encouraging learners to reflect on values while learning a foreign language. I’ve tried to promote cineliteracy, the ability to analyze moving images, through my resources and training.” He emphatically adds, “Cineliteracy is a 21st century skill which our students need to learn.” Here’s today’s Daily Edventure. Through my web site Film English, which has won various awards including Best Individual Blog and Runner-up in The Best Use of Video in the Edublog Awards 2011, I have been able to promote the use of moving images in language learning. I use detailed lesson plans designed around short films to help students learn English more effectively. I also really try to give my students opportunities to be creative in their language learning. 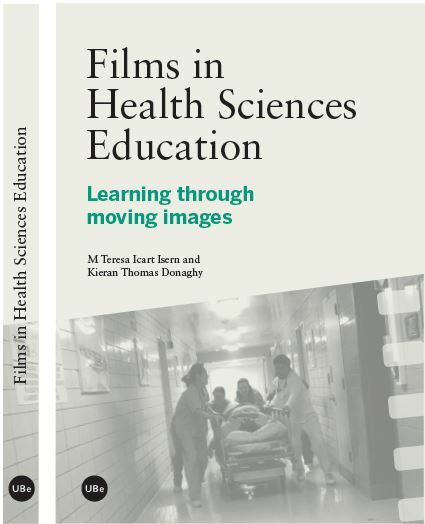 My book about how to use film to teach health sciences, Films in Health Sciences Education: Learning Through Moving Images, co-authored with Teresa Icart, Professor of Public Medicine at the University of Barcelona, has just been published and will be used as a set course book in faculties of medicine in Europe and North America. The book is very innovative in its approach, using 10 feature-length films to help health science students and professionals learn about their field through film. Lots of teachers throughout the world are using the detailed lesson plans on my website to teach English and other languages through film. I’ve received a lot of very positive feedback from teachers saying that the lessons engage and motivate their learners. I hear from educators that my resources and training have helped them use film more effectively in the classroom and to become more creative. I’d like to think that my sharing on my site has encouraged other teachers to share what they do. Other teachers can be motivated to start their own blog and share their passion and creative ideas. They can be inspired to be more creative teachers and give their students more opportunities to be creative. I am a firm believer in the power of digital technologies and the Internet. I encourage students to use various technologies to create, explore and think critically. The biggest problem in education in Spain at the moment is that over 30 percent of students are leaving secondary school with no qualifications. Something radical has to be done to change this situation, little tweaks won’t work, and the whole educational system has to change. However, the approach to education of politicians, parents and society in general is very conservative. With regard to language learning, language study has to be connected to the global economy, but this has been overlooked by national and local governments. We need better language education if we want Spain to have a globally competitive workforce. Multilingualism isn’t valued nearly enough by politicians and society in general in Spain. Not much. Cutting teachers’ salaries and increasing class sizes is what’s happening at the moment in Spain and this obviously doesn’t support education. There’s been quite a lot of investment in ICT in schools, but training on how to use this technology is not always adequate. With regard to education in general we need to stimulate a culture of innovation in education by giving teachers and learners more freedom to explore and express themselves. There needs to be far greater funding for language learning. However, even more importantly language learning and multilingualism need to be valued more in Spanish society. Another important change is for films and television to be shown in English and not dubbed into Spanish. We have a great opportunity to use digital technologies and the Internet in creative and innovative ways to engage and entertain language students. Take a chance, be creative, don’t be afraid to fail — failure is an essential part of the learning process. Write a blog to share your creative ideas. Use Twitter to connect, share and learn from others. Get connected with other teachers through social media. I’d recommend forgetting about teaching and concentrating on creating powerful and memorable learning experiences that connect with students’ passions. Be passionate and patient. Don’t ever give up. Outside the classroom students are using digital technologies and the Internet to help them learn languages. A powerful laptop and high-speed Internet access puts the world at your fingertip, and would ensure that every child in the world has the ability to learn about any field and from experts in any field. Website I check every day: I look at Vimeo.com to find inspiring short films and videos to use in my classes and to design lesson plans around for my website. Person who inspires me most: Benjamin Zephaniah is a writer and poet from Birmingham who really inspires me through his work and life. Favorite childhood memory: Going to the park to play football with my older brother every day. Next travel destination (work or pleasure): I’m going to Seville, Spain to give a session on learning vocabulary through moving images at the TESOL-Spain national convention. When was the last time you laughed? Why? This morning when my daughters did something funny at the breakfast table before they went to school. book, but one of my favorites is The Whereabouts of Eneas McNulty by Sebastian Barry. Favorite music: Three of my favorite singers are Otis Redding, Van Morrison, and Aretha Franklin. This entry was posted in People, Social media, Virtual Learning Environments and tagged Cineliteracy, language learning, language study, language teachers. Bookmark the permalink.